Nothing fires the imagination better than the words "African Safari." 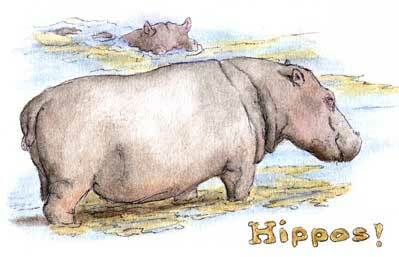 Your mind probably jumps to lions and elephants, rhinos and hippos, zebras, monkeys ~ whatever evokes the plains or jungles of Africa to you. 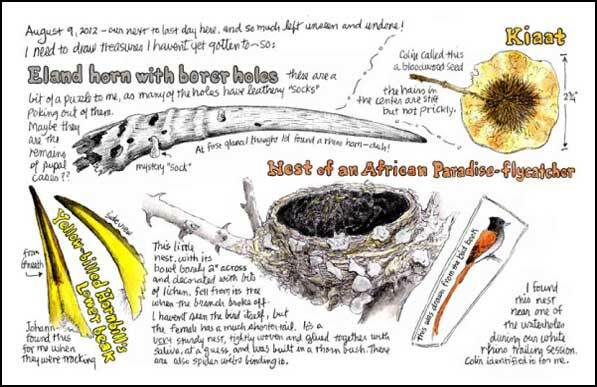 In this sketch journal you'll find them all, lovingly drawn and described as Irene stretched her curiosity to the limit while observing the thorny lowveld surrounding Kruger National Park in the wilds of South Africa. Come along as she shares her adventures in story and pictures on this trip of a lifetime. (click on most images for a larger view). There's a detailed tutorial opposite every sketch page in this lavishly illustrated journal. Irene explains why she chose each scene and how/why she created each page in a clear and informative but still engaging way. At the same time, you'll learn how termites eat a zebra muffin and why the baboon seems to glower so meanly (among other things). 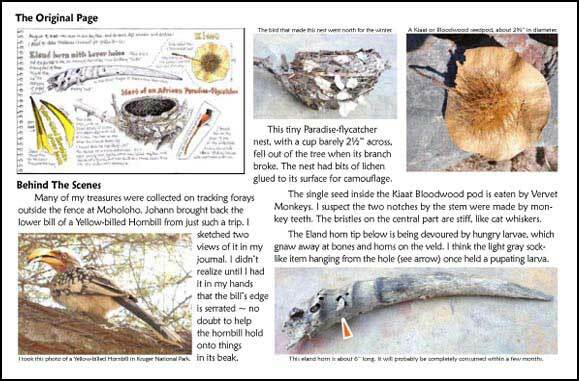 Since she also photographs her scenes, the tutorial side of each spread is sprinkled liberally with her best shots of African wildlife (and some that are not so terrific but interesting anyway ~ promise: you won't be bored). 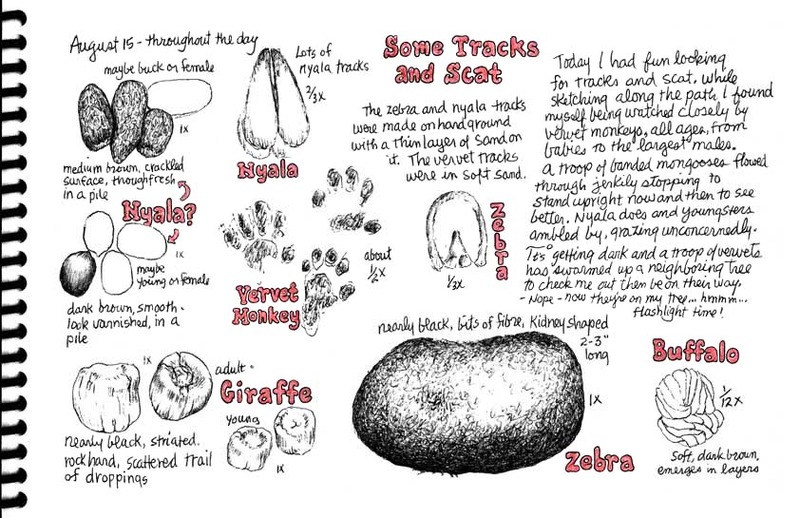 In this sketch journal Irene describes the stalking of a white rhino, and a monkey attack on her reference books. She explains the usefulness and etiquette of sketching wildlife in rehabilitation centers. There's also a word to the wise about what not to bring back from your journey abroad (and why). In the course of her three week sojourn, Irene went on several game drives in Kruger National park, coming across such wonders as these hyenas, protecting their kill from lions (or passing Landrovers). When you download your copy, you'll discover that each page of the sketchbook is reproduced in its original 8.5" x 5.5" size, so you can examine it in detail. In the tutorial you'll get a chance to see what the original sketch or painting looked like, then what she did (if anything) to tweak it to its final appearance. 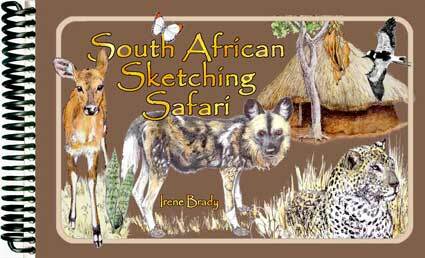 filled with advice on such things as sketching pleine air on the thorny veld, how to fill your sketchbook even if you're on a fast-moving guided tour, and how to prepare your sketchbook and your field guides for a safe journey on a rough-and-tumble safari ~ and much more. 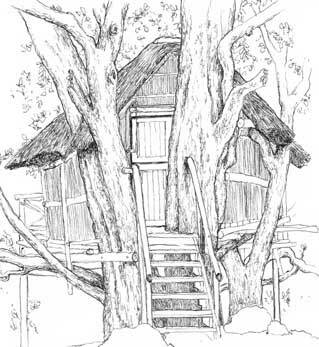 Living in a treehouse above an African riverbank was one of the high points of the safari, and two spreads are devoted to these fantastic dwellings, along with a mini-tutorial on how to draw such a complex subject, including how to select the view by visually framing it, how to mentally assign proportions, and some tips for how to get everything down on the paper accurately. Many of the sketches are colored/painted with watercolor pencils. 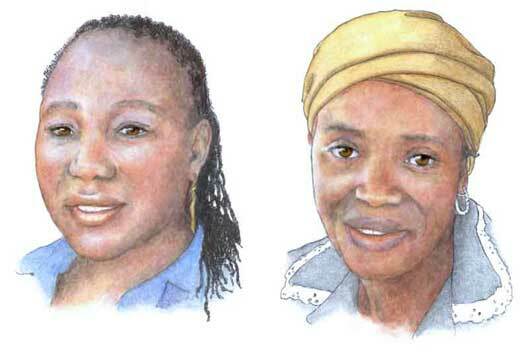 If you think watercolor pencils are a second-rate medium (some people think so), check out these portraits that appear in the sketchbook. Winter in South Africa is mild and lovely. 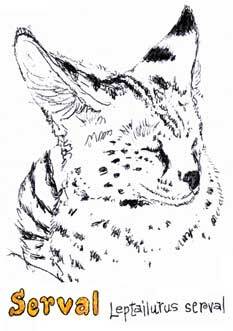 Every day was a day to sketch, a day to explore and wander about (keeping leopards and rhinos in mind, of course). The first part of Irene's trip was spent in tracking school where she learned to tell one track from another, and she's glad to share her expertise with you on a page or two like the one here. 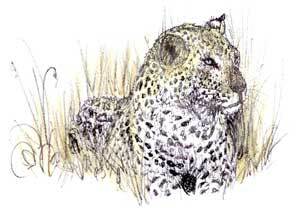 Come along today on a sketching safari you wouldn't want to miss. Who knows when you'll get another chance? GIFT IDEA: you could print this out on heavy paper and get it bound at a print shop to create a lovely gift for an artist in your life. This travel journal is in the form of a PDF which you can download then open with Acrobat® or Acrobat® Reader®, save to your computer, and print out immediately on 8½ x 11 paper if you want.